Our sauces show that the Finger Lakes can bring the heat with the best of them. 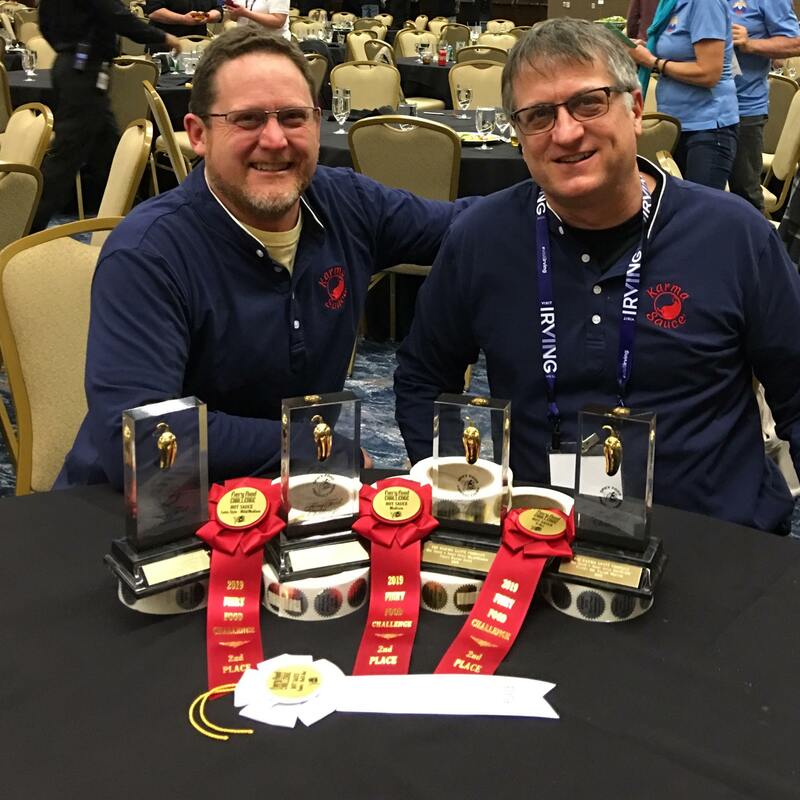 The Karma Sauce Company continued its storied reign at ZestFest, the national food exhibition which celebrates spicy fare from around the country, when seven products won eight awards including four first place finishes for Golden Chile awards. ZestFest hosts the annual Fiery Food Challenge which awards Golden Chiles, or “The Oscars” of spicy food. After this year’s Fiery Food Challenge, Karma Sauce upped its cumulative Golden Chile award total to 19 since it first entered the competition in 2012. Karma Sauce’s 2019 Golden Chile-winning products and their categories are as follows: Curry Karma Sauce, Hot Sauce: Asian Style – Mild/Medium; Funken Hot Yellow Moruga, Hot Sauce: Asian Style – Hot/X-Hot; Good Karma Sauce, Hot Sauce: Mild; and Rosie Chipotle, Salsa: Chipotle. The following Karma Sauce products were also awarded second and third-place finishes this year: Funken Hot, second place, Hot Sauce: X-Hot; Taco Rosso, second place, Hot Sauce: Latin – Mild/Medium; Bad Karma Sauce, second place, Hot Sauce: Medium; and Holé Molé (pronounced hol-ay mol-ay), third place, Hot Sauce: Exotic – Hot/X-Hot. Karma Sauce gained national recognition in 2017 when its Extreme Karma Sauce landed on season five of the YouTube series Hot Ones. To date, season five episodes have amassed over 60 million views. In 2018, Karma Sauce became the exclusive manufacturer of the Hot Ones-branded sauce Los Calientes. Karma Sauce owner/founder Gene Olczak collaborated on the recipe with HEATONIST founders Noah Chaimberg and Tyler McKusick, the sauce curators for Hot Ones. To learn more about this collaboration visit: https://karmasauce.com/blogs/news. About Karma Sauce: Karma Sauce specializes in handcrafting minimally processed sauces in small batches from the highest quality ingredients. Karma Sauce grows hot and super hot peppers, tomatoes, and tomatillos on Burning Springs Farm in Bristol, NY. Everything grown on thae farm is processed and filled by hand at the Karma Sauce factory in downtown Rochester, NY. For more information, please visit karmasauce.com.